FRANKLIN, WI (March 19, 2018) – Don’t wait for Foxconn – there are plenty of jobs available now in Franklin, Wisconsin. 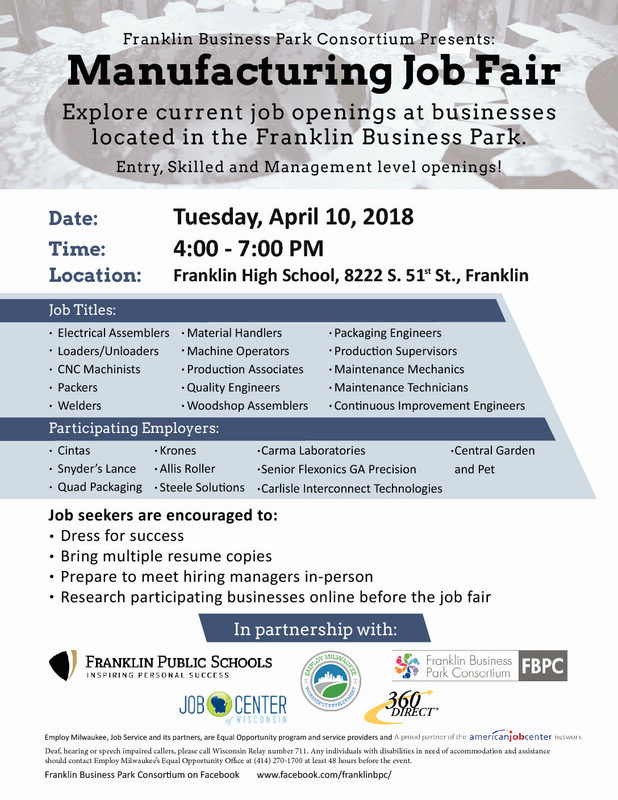 A job fair focused on manufacturing and skilled trade jobs is taking place at Franklin High School on Tuesday, April 10, 2018 from 4:00-7:00 pm. The Franklin Business Park Consortium is sponsoring the job fair, in partnership with Franklin Public Schools, Employ Milwaukee, the Job Center of Wisconsin, and 360 Direct. Job openings range from entry level to mid-management, with job titles such as Engineer, Material Handler, CNC Machinist, and more. Job seekers are encouraged to come prepared to meet hiring managers in person and with multiple copies of their resume in hand. The Franklin Business Park Consortium (FBPC) is an ever-growing collaboration between the 70 companies and thousands of employees that together make up the Franklin Business Park. As one of the 10 largest industrial parks in Wisconsin, the FBPC seeks to leverage their industry expertise, resources, and ideas to continue growing the local and national economy and improve job opportunities here in Southeastern Wisconsin. From workforce development and collaborations with local learning institutions, to fostering apprenticeship programs and corporate collaboration, the FBPC hopes to generate mutually beneficial relationships between job creators and the community as a whole.